The Screen Actors Guild Awards have concluded leaving a trail of winners and losers behind. We’ve compiled some our favourite speeches together. Oh, the award season is on fire right now! We are seeing quite a few winner patterns right now, which may possibly serve as a precursor for the outcome of the Academy Awards. The Screen Actors Guild Awards (SAG) wrapped up on Saturday evening with a fine selection of winners and a few good laughs (but more on that later). Matthew McConaughey continues to garner praise for his performance in the Dallas Buyers Club, picking up a SAG statuette for Best Male Actor in a Leading Role, whilst Jared Leto picked up the Best Supporting Role award for the same film. Cate Blanchett also continued to reign, grabbing the Best Female Actor in a Leading Role for Blue Jasmine, while newcomer Lupita Nyong’o nabbed the Best Female Actor in a Supporting Role for 12 Years a Slave. Bryan Cranston picked up a SAG Award for Male Actor in Drama Series and started off his speech by checking his makeup in a cute Breaking Bad-themed compact mirror. Than he sang. Then he told a sweet story of how he met Emma Thompson. Cranston is just a funny and adorable man. Upon receiving her award, Cate Blanchett was irked by the avid calls to cut her speech short by the ceremony’s crew. She wasn’t having any of it, pointing out that Matthew McConaughey got to ramble about Neptune during his speech. Then she did some unseemly things to the SAG Award statue. 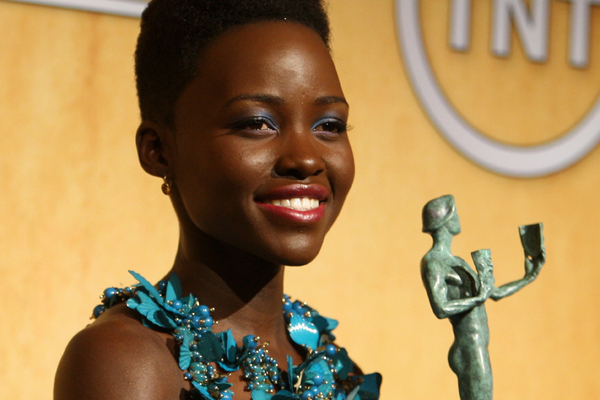 This is not the first time Lupita Nyong’o’s speech made us cry. The actress was very emotional but was able to deliver a very beautiful and composed speech. We’re very quickly falling in love with her. Oh Jared Leto, you saucy man, you! Do you have a favourite SAG Awards moment? Are you happy with the winner selection?